When I self-tan my face, I make sure to contour where I can. Contouring is a great way to give your face extra definition, make it seem thinner, or make something that you don’t like appear less noticeable. It also helps create a natural glow. If you apply the self tanner in one even layer, it can make your skin look flat and dull… even dirty if you over do it! Applying it with a contour looks healthier and more realistic. Remember to start light and build your bronze. It’s always easier to add more contour than to take it away. I highly recommend that you check out this video tutorial or this quickie cheat sheet from Cara of the MaskCara blog. She explains contouring really well and gives some great step by step pointers. I’ve also pinned her contouring tips to my Pinterest page on my Beautify board, along with a few others, so follow me there to get easy access. Make sure you start with freshly exfoliated skin. The tan will develop in the uppermost layers of the skin so you want to work on the freshest layers possible. You don’t want to use anything irritating or deeply exfoliating. A gentle peel the night before, or a glycolic wash before applying is perfect. I also sometimes like to apply a super light oil free moisturizer or hydrating serum. It gives you a bit of a buffer zone. Spray in wide circles, aiming for the outside perimeter of the face. Make sure to hit the neck. The aerosol self-tanner I love is Body Drench Quick Tan Instant Self Tanner Spray. Don’t be scared. Aerosols are so easy to use. Using a compact but soft brush, apply small amounts of the self tanner (gels work best in this case) as you would contour your face… under the cheek bones, one the neck, under the chin, and around the sides of the forehead. The Sun Gelee I used for the contouring is from Spray di Sole and I love it. 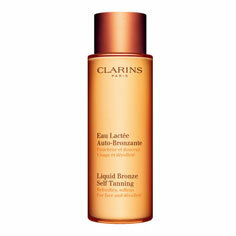 Another to try is Clarins Liquid Bronze Self Tanning . It’s not tinted, but it’s easy to work with a gives a nice color. Make sure to layer. Less is more. Don’t be an oompa-loompa. Keep in mind that the tan will develop after several hours. Don’t get wet in that amount of time. Check out my before and after shot to get an idea of how much my color developed after I finished filming the tutorial. Like this video? Make sure to subscribe to the YouTube channel. Share your own tips by leaving a comment below or join the conversation on Facebook!